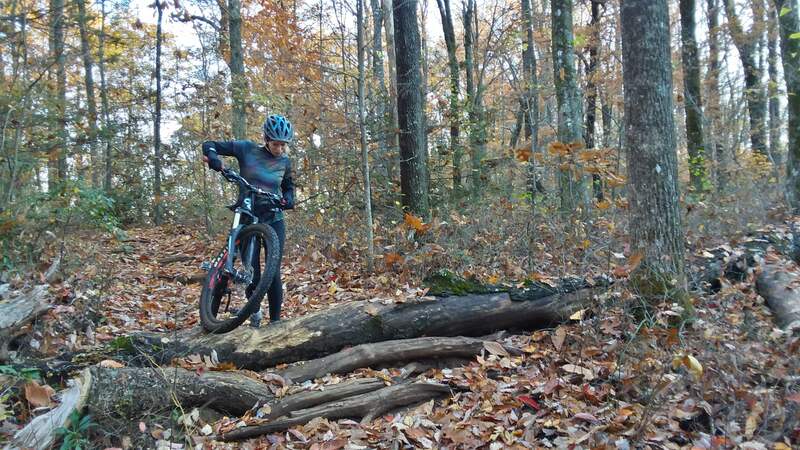 I was first introduced to the Enduro format of racing at the inaugural Moonshiner's Enduro last October. With those fond memories in mind, I quickly signed up for this year's event as soon as registration was live. 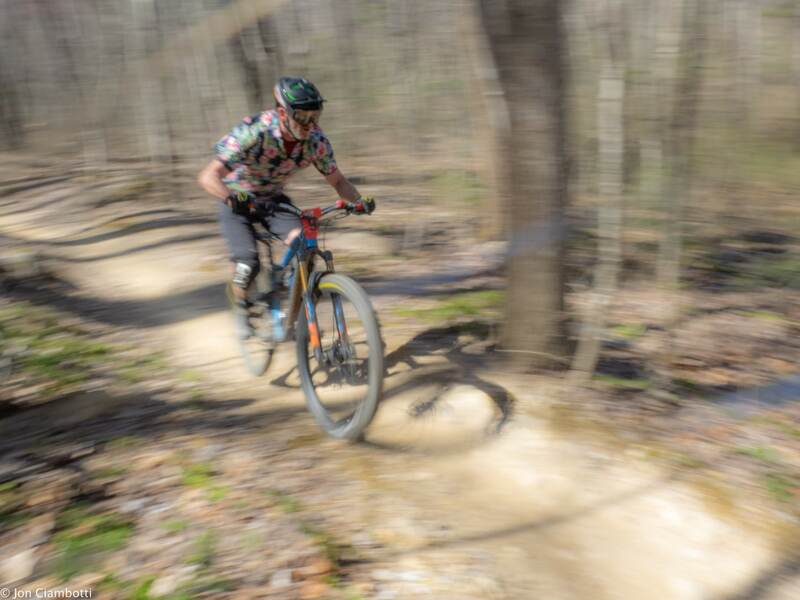 This year, the event was broadened to a mountain-bike-festival of sorts, with an XC race on Saturday, onsite camping, bike demos, and food support from local vendors. I drove up on Saturday to meet friends for some preriding. 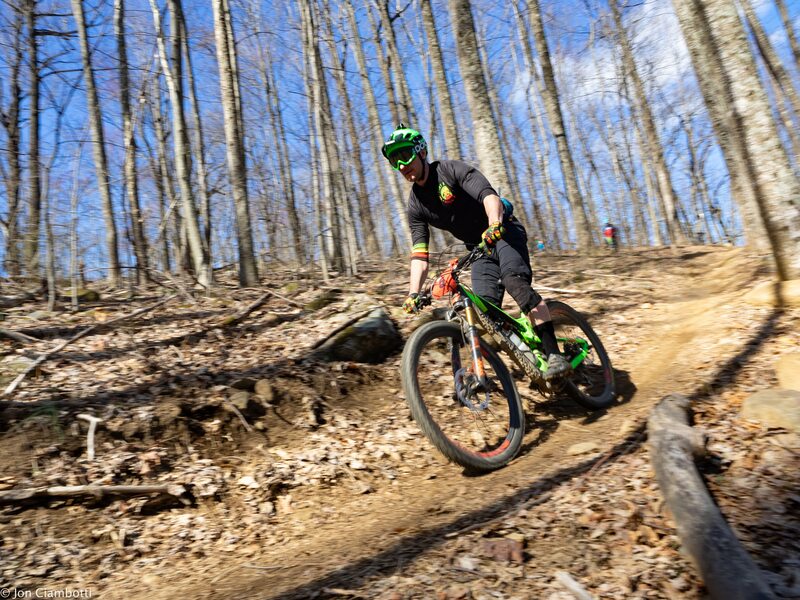 One of our buddies, Chris, had been leading much of the new trailbuilding for the event, so he led us through some of the stages to give us a taste of what to expect on Sunday. 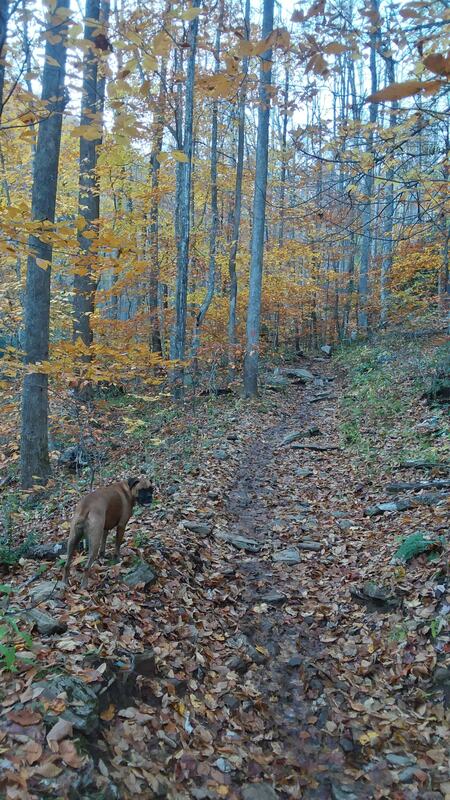 The existing trails there are phenomenal, and the new ones perfectly matched this level of greatness. In fact, the new trails had a bit more gnar in their steepness and rocky technicality - both of which were welcomed additions. On the day of the event, we pedaled to the top of the start as a massive group, creating a train of riders several switchbacks long. At the start, organizer Sam Lindblom gave us the pre-race essentials and let us choose our starting positions within each heat. I chose to start near the beginning of the 19+ category, a few positions behind fellow rider Charlie Snyder, who would eventually claim the W for our category. After the start, the race feels like a big group ride with friends. After each stage, you tend to regroup with fellow racers, tell some tales of harrowing near-misses, then pedal along to the next stage together. 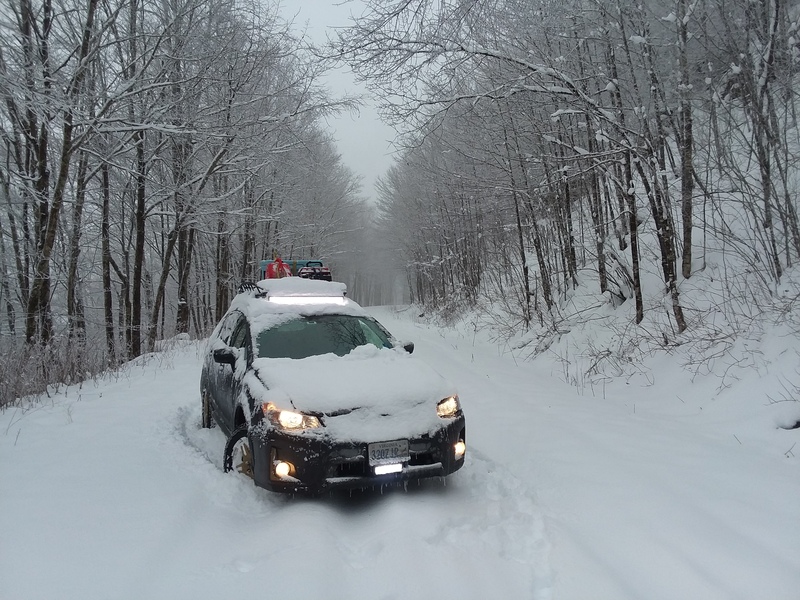 It's this format that makes for a great day in the woods while still giving the racer the adrenaline rush of pushing it to the limit in each of six stages. I'm definitely a fan of this approach to racing, and am considering entering in some of the West Virginia Series during this upcoming season. Each time we visit Bryce Resort to ride mountain bikes, I wonder how the resort would stack up to others in its winter season. 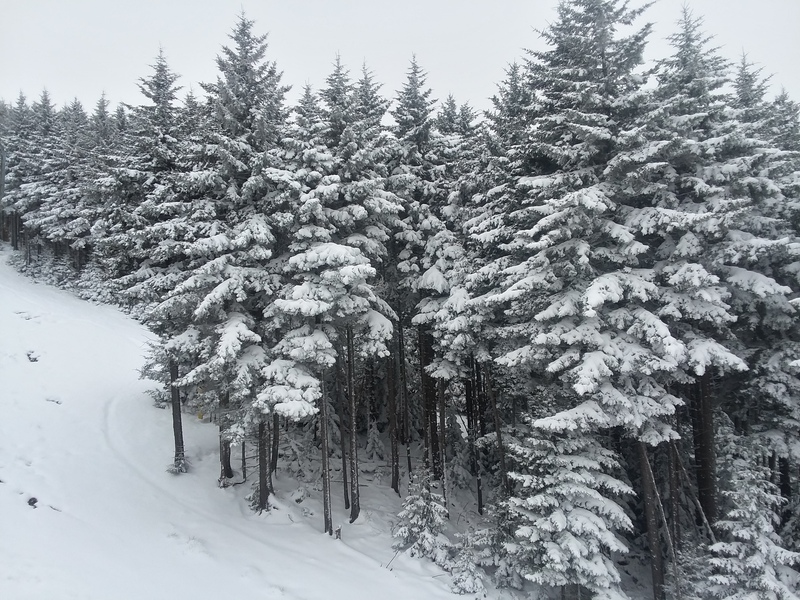 The resort sits at a relatively low elevation, just over 1,200 feet, but is littered with snow-making nozzles. As Rebecca and I discovered on a relatively mild day in February, those nozzles were well-deserved. The land around the resort was completely brown - not even a speck of snow remaining after several above-average-temperature days. The slopes, however, remained covered in snow. Despite having only one lift, we experienced no delays in loading the chair. To add to the crowd, there was a collegiate competition that weekend. Even so, there was zero issue with overcrowding. The trip to Bryce marked the first test of my new Ossur knee brace. I purchased it after experiencing prolonged pain in my knee following a simple over-rotation while working on the Crosstrek. In other words, I didn't injure my knee, but wanted to prevent the possibility of doing so. I was delighted to experience no discomfort with the brace. I tested this with a few board presses, surface spins, and other moves which required the lateral movement of my knee. 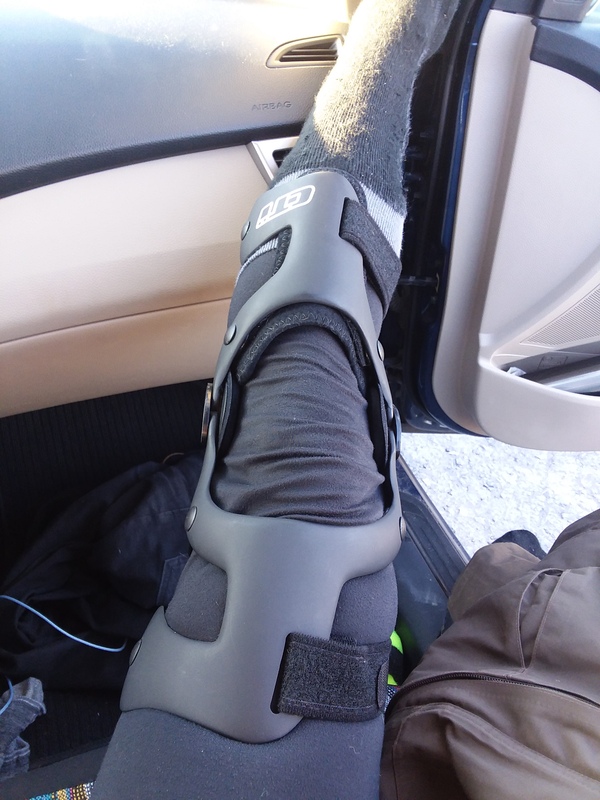 All movements felt fine, and the brace seemed to stay in place the entire day. Rebecca and I were thoroughly pleased with our first experience at Bryce. With its proximity to Winchester (Rebecca's hometown), I expect we'll be making another trip or two before season's end. Checking the weather forecast for Snowshoe has been part of my daily routine for a few weeks. 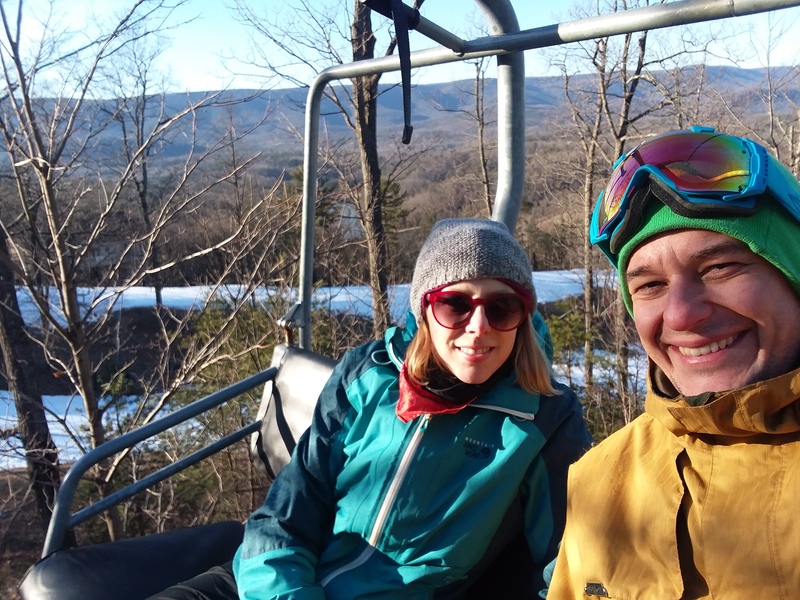 The fluke 40 degree day is a deal-breaker, though, as it means the top layer of snow will be melting and refreezing, giving the slopes a layer of ice. This week, however, the temperatures remained below freezing. Furthermore, the mountain was blessed with some generous snowfall the past few days. Since lodging prices are astronomical, I decided I'd try to survive a night in the car at our favorite camping spot near Slatyfork. Even if the temperatures turned out to be unbearable, I could always turn on the car to warm things up. With that said, I had ZERO luck finding any willing participants to join me. No problem - I'd test out the overnighter myself and report back to those doubting my sanity. 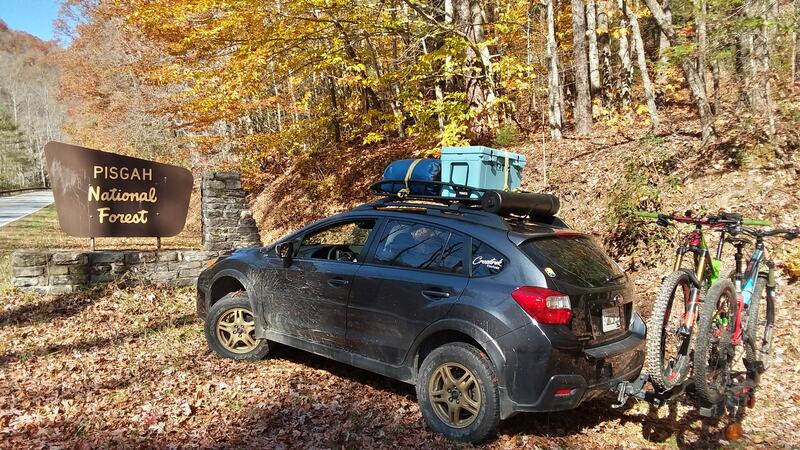 Prior to this trip, I'd installed a light bar to the cargo box of the Crosstrek, so I was eager to test out its effect. Once I'd reached the campsite, I set to starting a fire. A few beers later I was settling into the car for my overnight stay, running the car's heat one last time before I called it a night. Through the course of the night, I woke several times, indicating that it must've been a bit chilly despite feeling relatively comfortable each time I woke. The next morning I rose from my sleeping bag and began packing up camp. 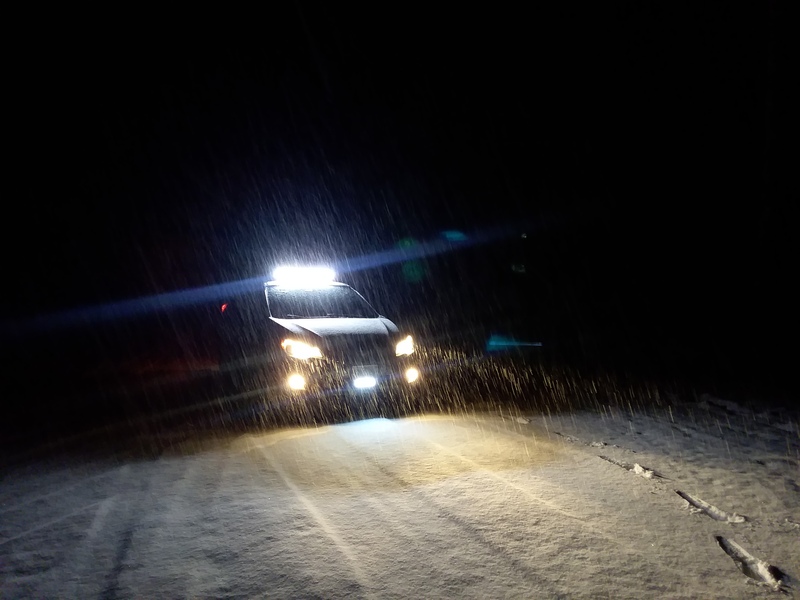 Snowfall had continued through the night, depositing an additional 6 inches of snow on top of an already impressive base. 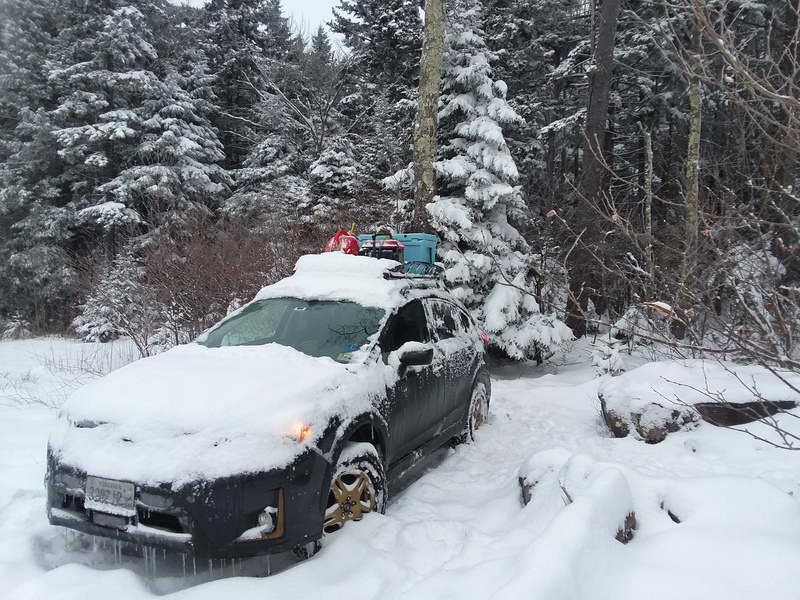 Regardless of this extra depth, the Crosstrek handled the conditions in perfect form. Not even once did it struggle for traction! 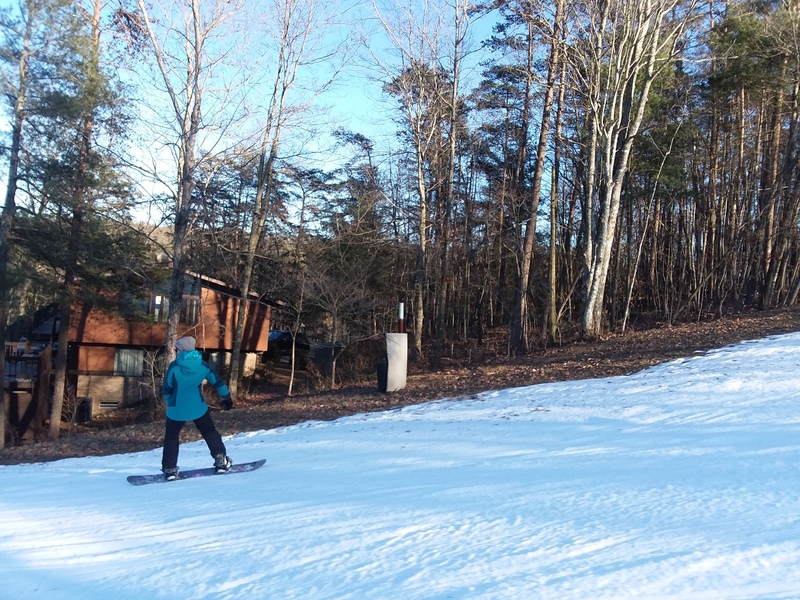 I arrived at Snowshoe around 9am, and was on the slopes soon after. 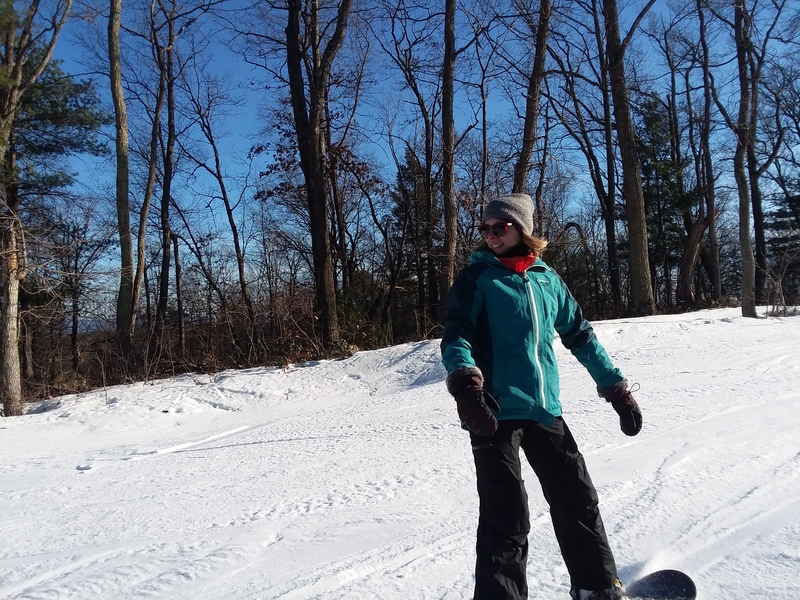 Although it has clearly been a light season thus far, they did have enough soft stuff to allow me to shred the edges, peeking in and out of the trees along the border of the slopes. I have a feeling the glade runs will be a long time coming, if at all this season. With that said, I'll be keeping an eye on the trail report in order to return for another snowy weekend. 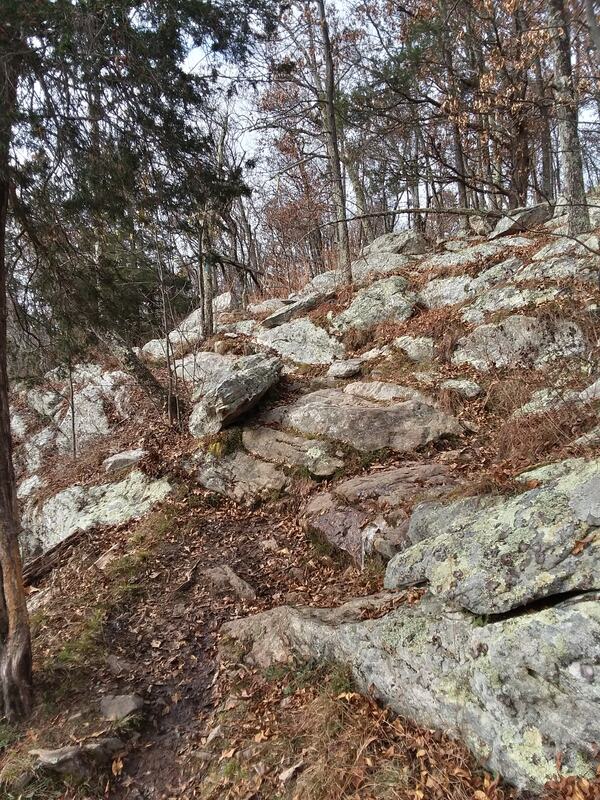 One of our favorite adventures each winter is the pilgrimage to a PATC cabin within the Shenandoah Park. 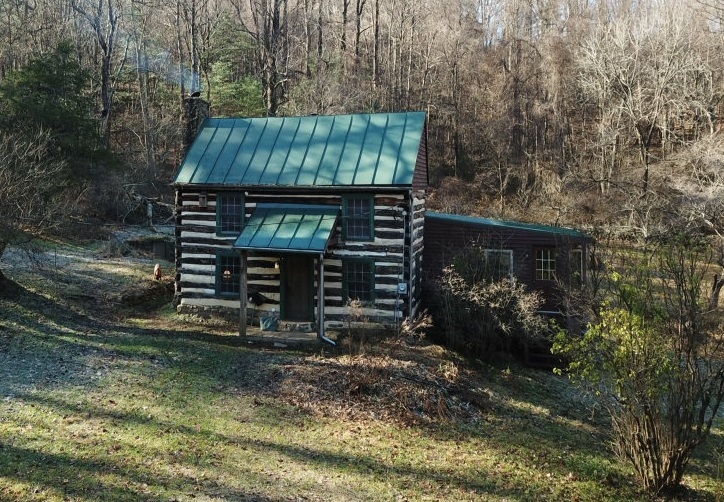 This weekend's trip to Lambert cabin was especially enjoyable, since this cabin had WATER and ELECTRICITY! What luxuries! This cabin was actually inhabited by a very special couple as recently as 2006. Darwin and Eileen Lambert were both authors, as well as being great stewards of the land around their house. 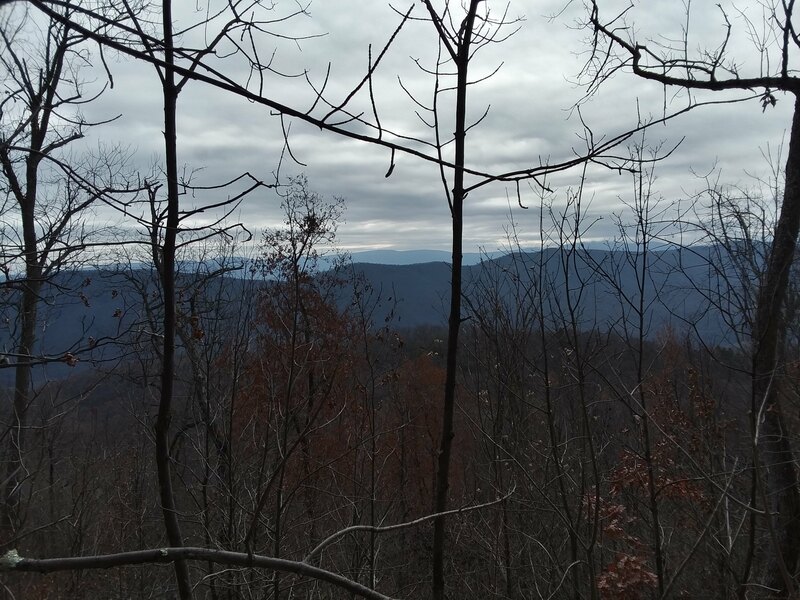 In fact, Darwin was the first employee of the Shenandoah National Park. It was exciting to learn about them while staying in their old home. During our trip to Lambert, I snuck in a ride near Catherine's Furnace. My ride began just as the sun rose and I pedaled over frozen ground as the sun slowly warmed us both. 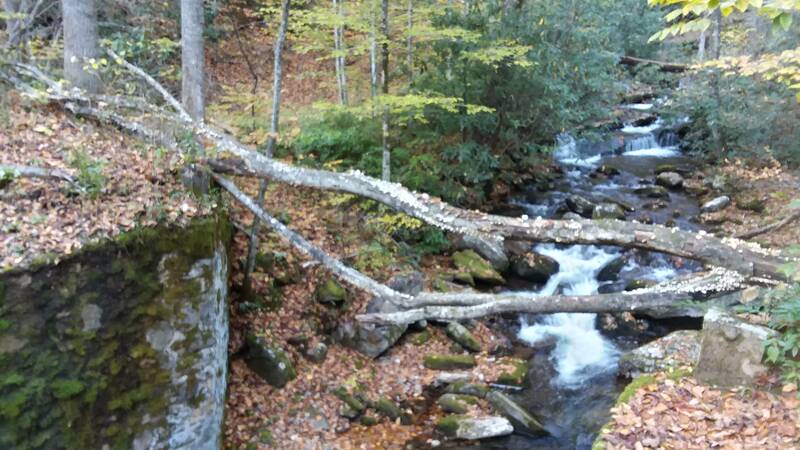 The day after Thanksgiving, I decided to head to Elizabeth Furnace for an abridged loop of the Figure 8 of Hate. The temperature on the dashboard read 28 degrees when I set out for the trailhead at 6:30am. This would normally be a dreadful sight, but I must admit that nearly any temperature is bearable as long as I'm using my Bar Mitts and Louis Garneau ear covers. The loop did feature several water crossings. Most could be rock-hopped, but some required me to remove shoes & socks and simply trudge through the cold water. After my morning at the Overland Expo, I headed back to the AirBnb to rendezvous with Rebecca. The cold was creeping in and the cabin was warm & cozy, so convincing her to don riding gear & head outside wasn't exactly a simple task. Eventually, though, we made our way to the trailhead of the Daniel Ridge Loop. The loop seemed like a perfect afternoon ride for us and the dogs, with under 800 feet of climbing and a simple route to follow. 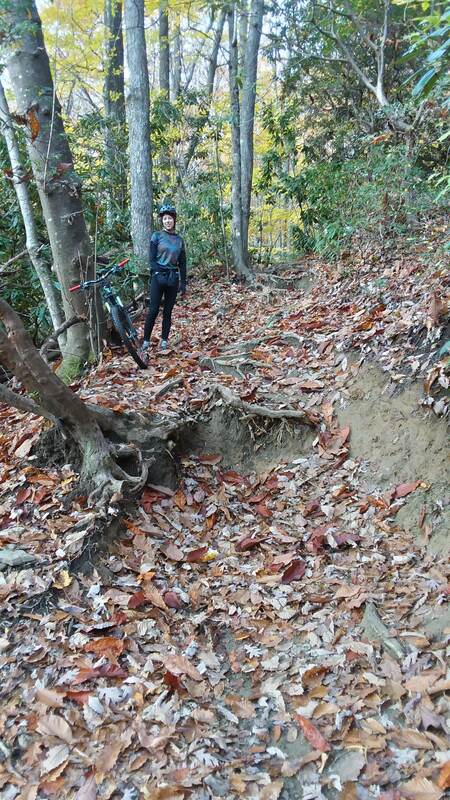 The descent was wild, with rutted lines and some rather ambitious drops. During this time of the year, another aspect of the ride is the mystery of what rocky gnar lies beneath the carpet of leaves. This caught Rebecca once, tossing her to the ground on an already bruised knee and hip. She triumphantly pressed on, though, insisting on getting back on the bike to pedal it out rather than allow the pain to set in. Eventually, the pain subsided and she regained her typical demeanor, getting shifty on a log pile with some radical parkour moves!